On my first visit to Tokyo several years ago, several co-workers and I, rather on a whim, decided to go out to lunch one day. We wanted amazing sushi, and were able to fairly last minute get reservations at Sushi Kanesaka, then 2 Michelin stars. It was a mind blowing experience, as we all decided to be crazy and get one of the higher end omakase sets. By far the most money I'd ever spent on a meal before, let alone lunch. By far the freshest sushi I'd ever had. Such a memorable experience. 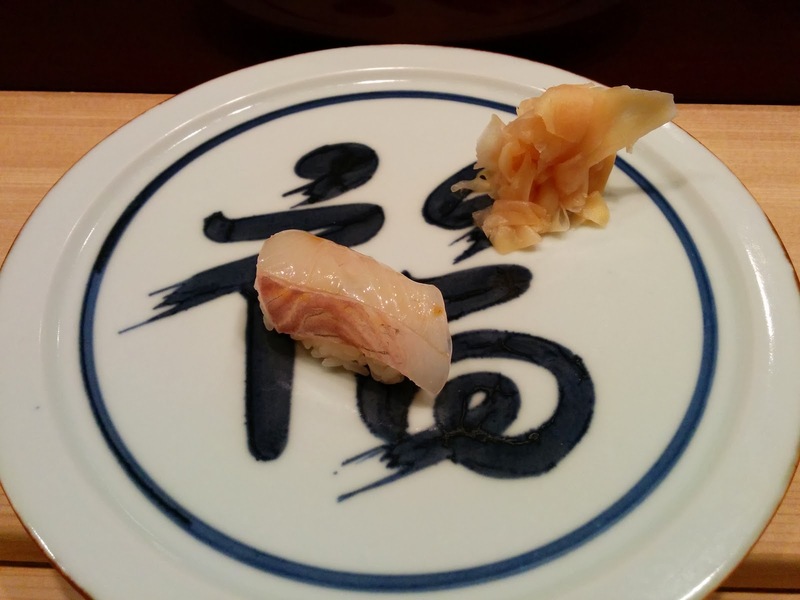 When I recently returned to Tokyo, I knew I wanted to have at least one great sushi meal. I of course tried to get reservations at all of the top places, but they require reservations as far out as they book, and we only planed our visit 3 weeks in advance. Also, we were a group of 6, which would completely fill many of the highest regarded establishments. So, no Jiro for me. There were a couple other Michelin starred sushi places we could have gotten in at, but all carried very hefty price tags. I remembered Kanesaka, and looked it back up to find that they had been relegated to only one star, but, they also offered reasonably priced set lunches. And, amazingly, they could fit our large group on the Saturday we were in town. Done! 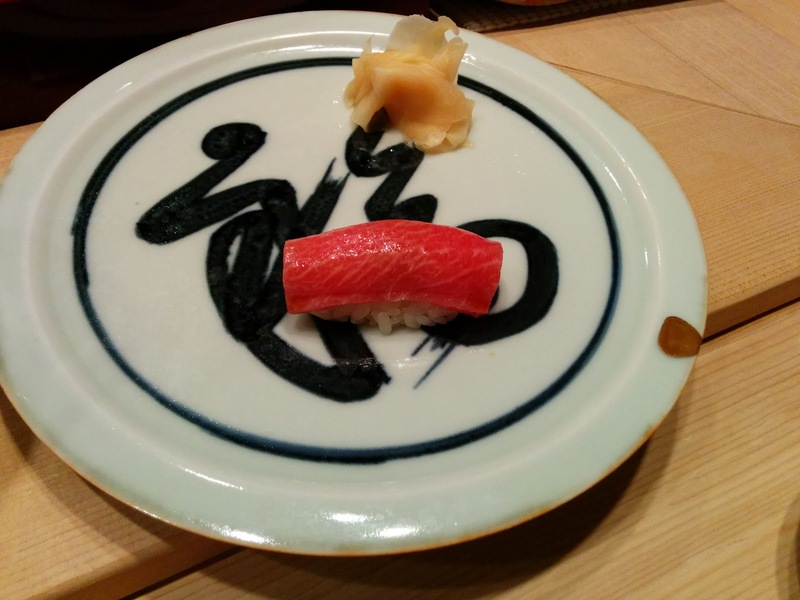 Sushi Kanesaka has also expanded to a second location, but we visited the original, in the basement of a building in Ginza, a bit hard to find if you don't know what you are looking for, as there is no signage in English. The sushi bar is small, with only 16 seats, divided into two sections, each with its own chef, 8 seats per chef. Our group of 6, plus one other patron, were assigned to one chef, the other side of the restaurant had about 6 people total, served by the other chef. Once seated, we were asked if we wanted just nigiri, or a mix of nigiri and sashimi. 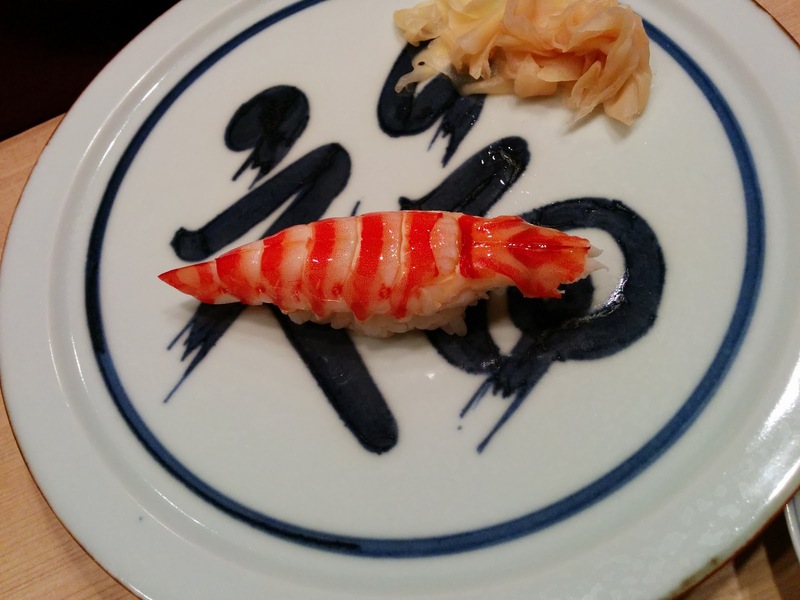 There is no menu, no a la carte ordering, everything is omakase, which we knew and expected. We said we wanted both. Price options were then presented to us, which, I didn't write down, but were somewhere in the $290+ range. Uh ... whoops? I thought they were supposed to have reasonable lunch options? While we all took a moment to deliberate, I insisted that there were other options, and asked the member of our group who spoke some Japanese to ask about them. 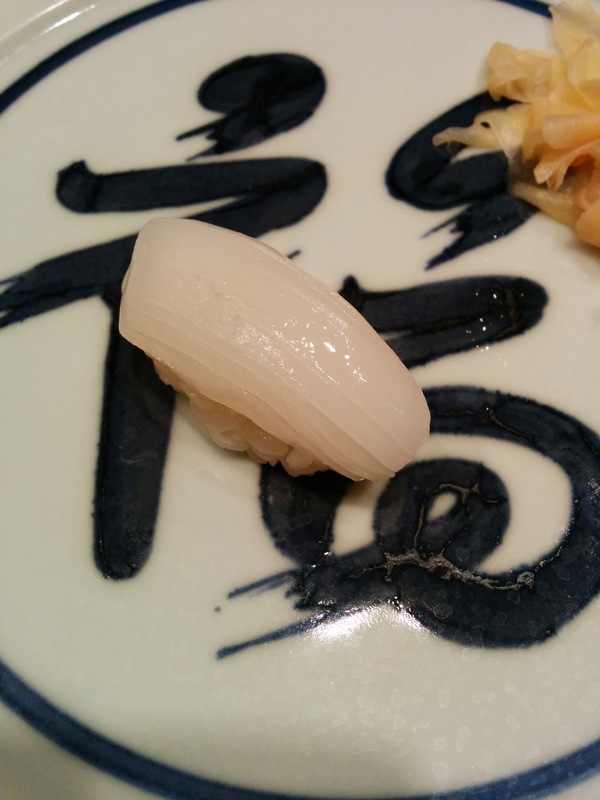 Sure enough, if we were willing to stick in nigiri only, there were 3 omakase options: ¥5,000, ¥10,000, or ¥15,000. Phew. I knew we were going out to a huge dinner that night (more Michelin star french cuisine! ), so I went for the smallest option, and was told it would include about 10 pieces. One other person joined me in my small feast, two others picked the mid-range, and the final two went for the highest priced one. This allowed us to see what the different price ranges really offered. After seeing all the different options, it seemed like the ¥5,000 was a great deal, and the ¥15,000 really did include premium selections, but the ¥10,000 seemed like the worst pick, as, yes, it included a few more pieces, but definitely not twice as many, and didn't include the premium cuts. I was quite happy with my choice of sets, and I was really glad that they allowed us to all pick different sets. The sushi was all good, clearly very fresh, very high quality fish. But, it didn't blow me away in the same way that it had on that first visit. Partially, I think that it is because I've had plenty of good sushi since, but moreover, it is because most of the pieces weren't ones that I would have selected if ordering a la carte. Because it is omakase, we didn't have any say into what we received, and since that first visit to Sushi Kanesaka years ago, I've narrowed in more on the type of sushi I like. The pieces were all very good for what they were, but weren't ever going to be my favorites. The dining experience was a bit interactive, in that our chef was there preparing each piece directly in front of us. He interleaved preparing our dishes, and those for the other patron in our section, but we never waited long before receiving our next piece of sushi. Starter: Seaweed and diakon salad. To start, we were given a little salad of seaweed and diakon, drizzled with ponzu and sprinkled with sesame seeds. It was refreshing and light, the perfect way to start the meal. The ponzu was intensely flavorful! Throughout the meal, I was impressed with the focus and calm demeanor of the chef. It was only at the end of the meal that he stepped back to really chat with us. He was friendly and answered questions as he was going, but was clearly focused on his craft, and did not want to be distracted. Always wiping his blade between cuts. He was meticulous about cleaning the blade between cuts. While he sometimes sliced up a few different pieces at a time, he mostly prepared the pieces one at a time, and each of us would be served individually as soon as our piece was ready. He placed the piece directly onto the plate in front of us. I'm not sure what correct etiquette is, but it seemed right to each eat it as soon as it was placed in front of us, rather than waiting for everyone. The first piece, flounder. It was a bit firm, not my favorite. Next came marinated sea bream, but was only included in the medium and large sets, so I didn't get to try it. The texture on the yellowjack was really surprising. It was ... soft. Not mushy exactly, but soft. Quite strange. All the pieces came pre-sauced/seasoned, and we were instructed never to dip them in soy sauce. There were subtle citrus hints to this one, I didn't see what from, but I imagine there was lemon juice added. Interesting, but still not my favorite. Next began the tuna preparations. Those of us with the cheapest set just got standard maguro. 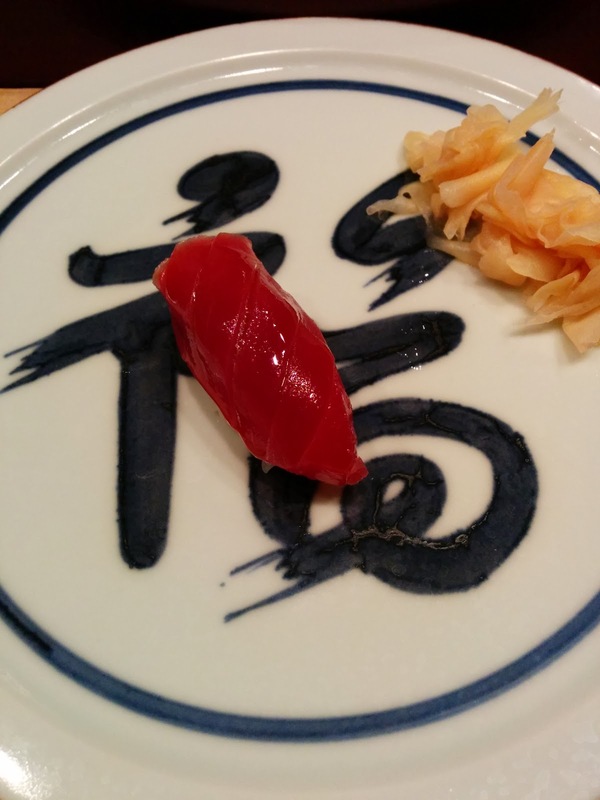 It was clearly very fresh, had a deep flavor, but somehow maguro always tastes a little too "bloody" for me. Those who got the mid-range set also got toro. And those with the largest set, got chūtoro, which they all of course loved. 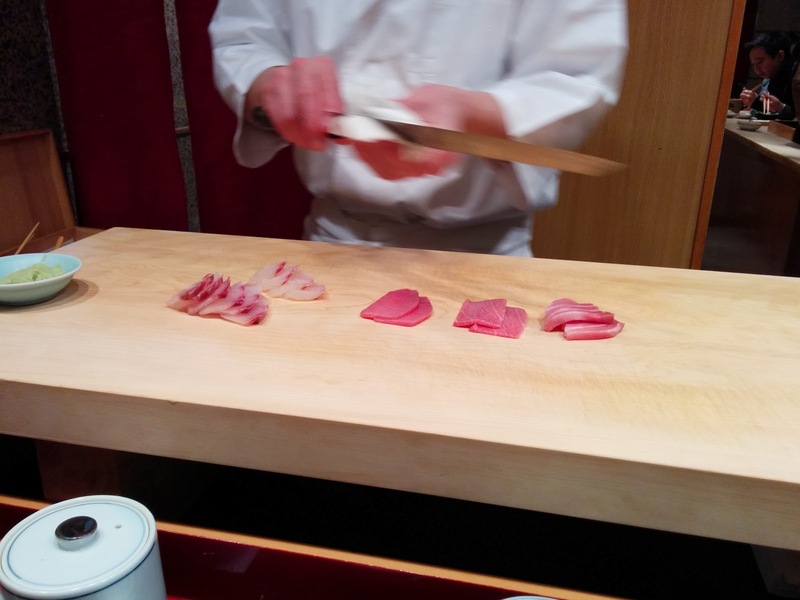 And of course, otoro, which was so fatty it was breaking apart, again, only for those who selected the premium set. Next, we all received squid. This one was really interesting, as it had lime squeezed over it and was topped with sea salt. The squid itself was firm and sweet, and quite nice, but the fresh lime and salt made it pretty spectacular. I called it "margarita squid". 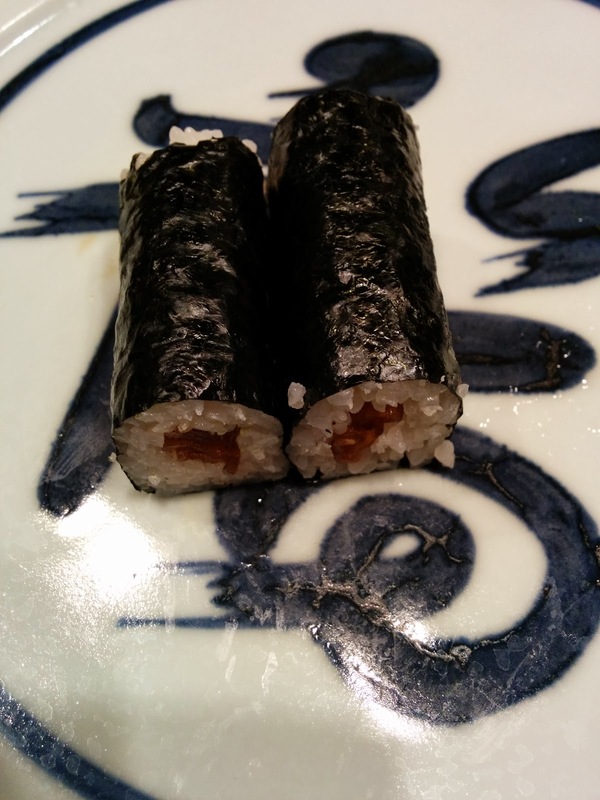 I can't say I'd ever had salt on sushi before, but, it worked, which makes sense, since soy sauce is very salty. My third favorite. But this was unlike any prawn or shrimp I'd ever had. It tasted far more like crab or lobster. The texture was perfect. It was also stuffed on the inside with shrimp powder, which intensified the overall flavor even more, and a hit of wasabi, for some kick. This was my favorite piece of the meal, and certainly the most memorable. Included in medium and large only, so I didn't try the Japanese anchovy. I don't generally care for oily, salty fish, but the aji was good. Firm fish, and while salty, it was quite enjoyable. Topped with a tiny amount of ground up Japanese chives. Speaking of salty, the mackerel steak was intensely salty, and had a very strong taste. I didn't care for it, but it was the favorite of one of my dining companions. Included in medium and large sets, this was actually a bunch of tiny little squids all pressed together. Next, octopus. It wasn't too rubbery, but it was a tiny bit too slimy for me on the edges. Included in large set only, geoduck. And for all of us, regular clam. This one shocked me, as I never really like clams. It was chewy, but ... I liked it. My forth pick, just behind margarita squid. An intermission, continuing the clam, miso soup, with small clams inside. It was warm, comforting, and actually really quite good. Miso soup doesn't tend to interest me, but this was far better than most. And then it happened. Uni. Always my favorite. And ... included in the medium and large sets only. I was pretty sad. One of my dining companions was going to be nice and let me have his when he saw how much I was missing it, but luckily I was able to ask for it to be added to my set too. It was creamy, delicious uni. My second favorite piece of the meal. 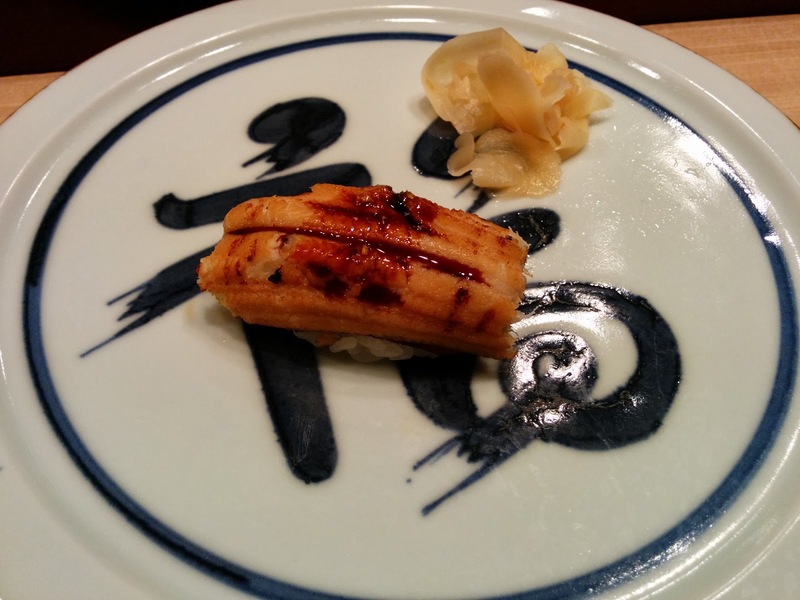 Next up was the anago, served warm, lightly sauced. My notes say, "good enough", which, for a piece I don't normally tend to like, is better than usual. The folks with the large set received this one, which looked remarkably like steak. Finally, always one of my favorite pieces, which I consider my "dessert": tamago. 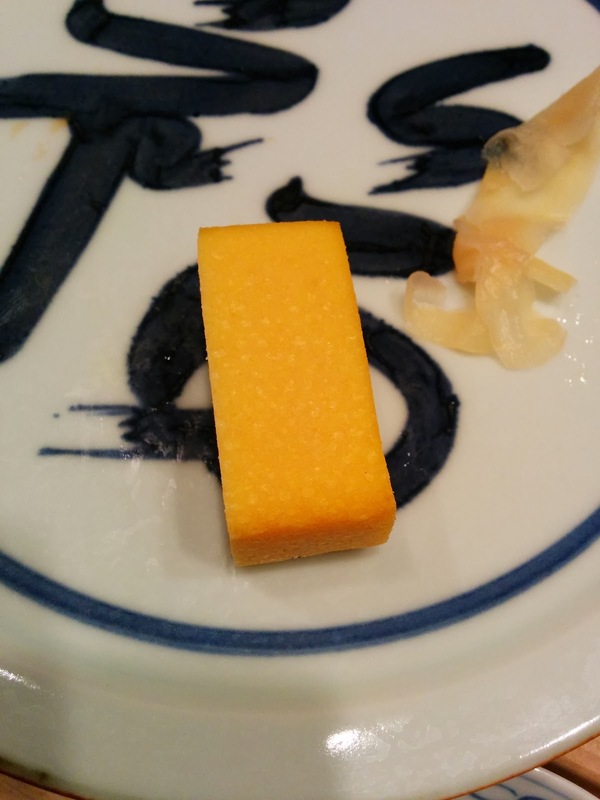 Only this tamago wasn't like any I'd had before. It wasn't layered. It wasn't as sweet. And, it contained shrimp. But it was richly custardy, and did complete my meal. Or so I thought. Tamago is usually the last piece, right? Then we received a vegetarian roll, filled with stewed squash. This was way too filling at this point in the meal. It was large, and there was so much rice. I was full before this, and I think it pushed me over the edge. Those with the large set received a negi-toro hand roll instead, which seems much more worth stuffing oneself for rather than squash! 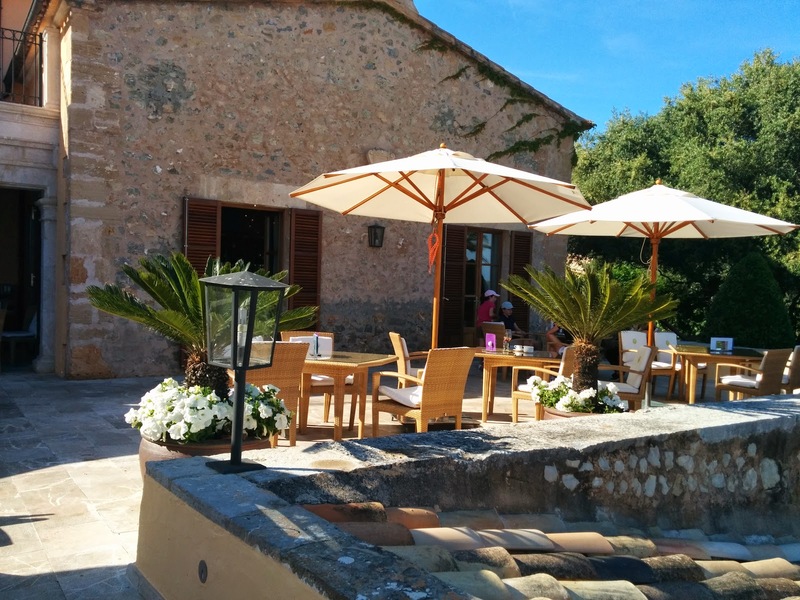 Our first dining experience in Mallorca was at one of the 5 Michelin star restaurants on the island, Jardín, for a 12 course tasting menu for lunch. It lasted many hours and left us absolutely stuffed. I intentionally did not book us a dinner that night, and left it to just do something casual and light that night, which turned out to be the right decision. But for the next day, I was eager to do some more great dining. I researched the restaurants in Alcúdia, where we were staying, but none jumped out at me. I looked in the Old Town, I looked in Puerto de Alcúdia (the major tourist area), and I looked at smaller local places. Nothing got great reviews, as much of the cuisine is geared towards British tourists. There were a lot of pizza places. Finally, I found something that sounded hopeful: Restaurant Club de Golf Alcanada, the restaurant at the golf club in the neighboring town. The menu had a few items that caught my eye (in particular, foie gras, and, as you know, foie gras is banned in California and I quite fond of it), but the real draw was the location, as all reviews raved about it. Inside, the restaurant is small, although the entire time we were there, we never saw anyone seated inside. Why? Because they have a huge terrace with absolutely gorgeous views. Set up on a hillside, the restaurant has an amazing vantage point over the bay. And they know it. Since I knew the restaurant is known for the views, when I made my booking for our large party, I specifically mentioned the view, and asked for a great table on the terrace. Making the reservation was easy, as I was able to do it over e-mail, and thus not need to deal with language barriers. We were all set to go, ready for our 1pm lunch reservation, looking forward to seeing the stunning sights. Ironman ... awesome, but, shut down the streets! And then … we learned that the Ironman was in town, which, though fascinating to see, became a major problem. Most roads were shut down. Taxis could not get to us. We originally thought this wasn’t too big of a deal, we’d just walk out to the main road, and get a cab there, as there seemed to be limited traffic on the main road. In the meantime, we started walking towards the restaurant, even though it was 4 miles away. Our reservation was in 30 minutes. To make a long story short, we spent a very long time trying to get a taxi, and never succeeded. We tried to call taxi companies, who hung up on us. We even flagged down taxis, but once we told them where we were going, they all refused to take us. It was only about 3 miles away at this point, but the drivers kept telling us they couldn’t get there due to the closed roads. Calling the restaurant, desperately seeking help ... in Spanish. I called the restaurant to let them know we were late, and to ask if we really could get there. After struggling to talk in Spanish to the first person who answered the phone, I was transferred to someone who spoke some English, who assured me that we could get there. So I told him we’d be late, but we were coming. We kept walking towards the restaurant, even though it was incredibly hot, and we had no water. Most of us were in sandals or flip flops (the ladies in dresses), so we not exactly appropriately dressed for much of a walk. We kept trying with cabs, and failing, so we finally asked a police officer for help. We told him where we were trying to go, and he assured us it was no problem, instructing us to walk a bit further down the road to the next rotary, and ask the police there. So we did. That police asked where we were going, we told him, and he said he would call us a cab. This sounded promising. Then he told us to go back another block and wait on the corner. So we did. And, a cab shows up. Great. Except ... it was the same driver who had previously refused us. He was adamant that he couldn’t get us there. We tried to ask if it was possible to just get us closer, as we had no problem walking part way. Over and over, we were told it was impossible. Finally we gave up, went to a very, very crappy place in the middle of the tourist area that we were now in, had some awful sangria and even worse tapas, and mourned our losses. Hours of research on my part down the drain. I consoled myself with a soft serve ice cream cone from a street vendor, which, actually was quite satisfying on the hot day. But, as you can tell, the story does not end here. We were now 2 miles from our villa, and were going to turn around to walk back, demoralized. But we realized that were also equidistant to the restaurant at this point, and, since we didn’t really each much at the tapas place, we decided to just keep going instead. The roads would be open later, so we could take a taxi home. It would be the same amount of walking, and we’d actually hopefully get some good food. Sure, it was now almost 4pm, so we wouldn’t get the beautiful weather and sunny daytime experience we were aiming for, but it was something. So we walked, all the way there. The first part of the walk was through the tourist area, so crowded, awful. Then it got desolate and boring. We passed a decommissioned power plant. It was pretty depressing. And then we found a stairwell, leading down to the water. We didn't really know where it would go, and it could take us far off track, but we took it anyway. Our efforts were rewarded, as the steps lead us to a walkway along the stunning rugged coastline. The walk turned into one of the best parts of our entire vacation. We wandered along the coastline, up on a cliff, checking out all the gorgeous villas. Along the way were access paths to the water. Dresses, flip flops, and all, we went climbing along the rocks, taking it all in. It was beautiful, all the rest of the way to the restaurant. But the next question … would the restaurant still be able to seat us? It was now 4:45pm, way after lunch, too early for dinner. Our group was originally 7 people, but two dropped out, bringing us down to 5. When we arrived, I asked for a table for 5, as we weren’t sure if they’d be really upset with us for not calling back and canceling our reservation. The patio was filled however, no free tables for a group our size. Except for one, a table, set for 7, right in prime location on the patio. I sheepishly told the person trying to find us a seat that I did have a reservation, I said my name, and instantly, she rolled her eyes, and went to fetch someone else. The next person saw me, said my name, and immediately knew who we were. It was clear that our very late party may have been a bit of an issue. I felt really bad, but, we had made it! At this point, another restaurant employee came out, who spoke English, clearly the person I’d spoken with on the phone, and had e-mailed before. He was incredibly welcoming and was amazed that we had walked there. I thanked him for saving us our prime table, and we settled in to order. The furniture was wicker, with comfortable padded cushions on the chairs, and a glass top. The setting was so beautiful that it really didn’t seem to matter that we’d just spent four very frustrating hours getting there. Sparkling water in hand, I was instantly relaxed. 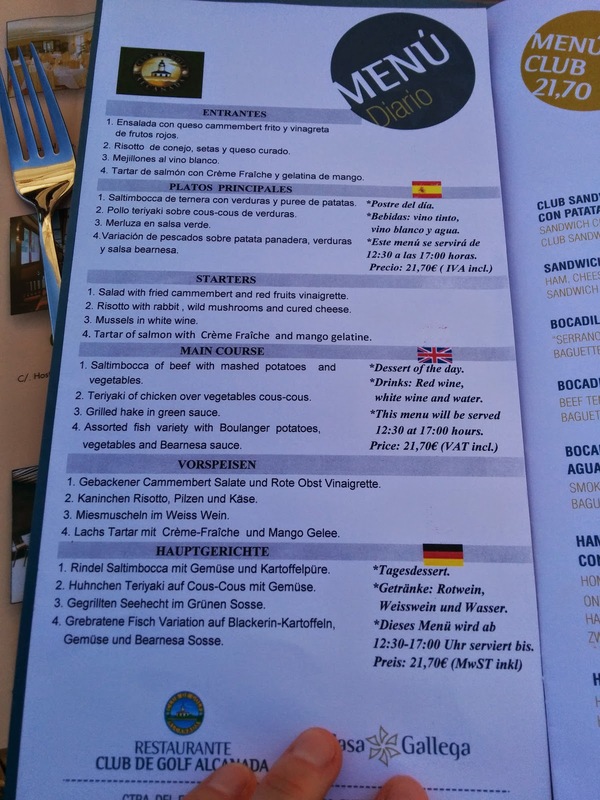 Along with the a la carte menu with the aforementioned foie, they also had a fantastic sounding Menu of the Day, a very common practice in Mallorca. 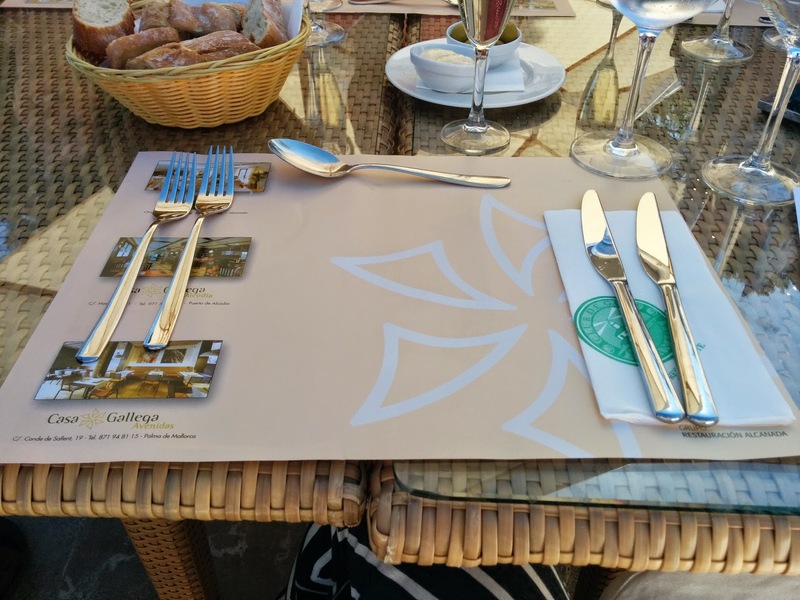 The details vary from restaurant to restaurant, but most offer a special daily menu for lunch. Some change daily, hence the name, others seemed more constant. All feature a starter and main, usually several selections each. All include a dessert, although I never saw an option given. And they all include drinks; for some that just meant water, others it included coffee with dessert, but for most it included house wine, often unlimited. The prices for the Menu of the Day are always shockingly low, particularly compared to the other menu items. I was eyeing the foie, but the lure of the Menu of the Day was too great. Salad with fried cammembert and red fruit vinaigrette. Risotto with rabbit, wild mushrooms, and cured cheese. Tartar of salmon with crème fraîche and mango gelatine. Saltimbocca of beef with mashed potatoes and vegetables. Teriyaki of chicken over vegetables cous-cous. Grilled hake in green sauce. Assorted fish variety with Boulanger potatoes, vegetables, and Bearnesa sauce. Add in a dessert and unlimited white or red wine, for 21.70€. It was too good of a deal to pass up, particularly because I really did want one of the appetizers, and two of the mains. Except the menu said it was served only until 5pm, and it was quickly approaching that time. The waiter came to take our drink order, and we all ordered sparkling water, as we were ridiculously dehydrated. And, of course, Emil ordered a bottle of Cava. We hastily said we wanted to order immediately, so we could get our order in by 5pm, and tried to check if that was still ok. The server was very friendly, and told us not to worry about it, to take our time, and we could still order it, even after 5pm. Overall, the food was mediocre and underwhelmed, but I still really enjoyed my dining experience. The stunning setting made up for the food, as did the friendliness of the servers, and the price really was remarkable. 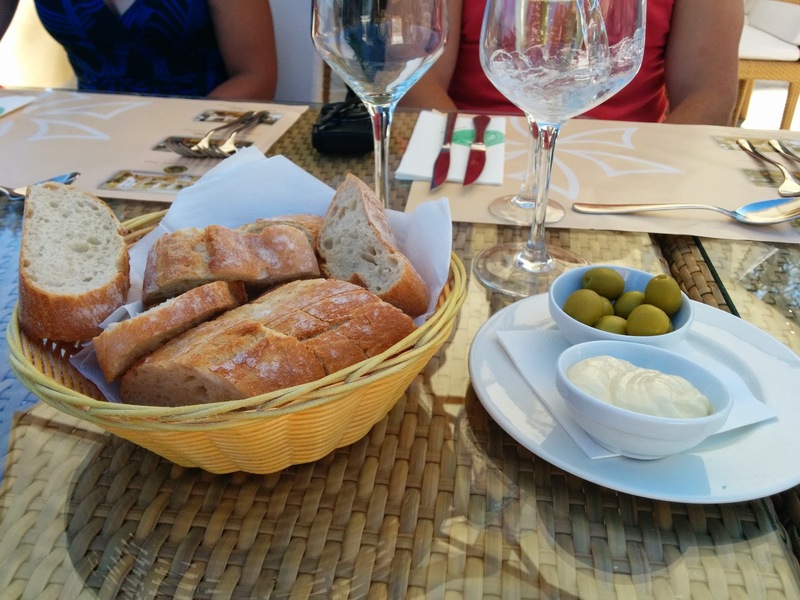 Moments after we were seated, a bread basket arrived, accompanied by a bowl of olives and butter. The olives were generic. But the butter … wow. The first person in our group that tasted it suddenly started talking about how good it was. I normally don’t go for bread, but I decided to give it a try, just to try the butter. How exciting was this butter really going to be? The bread had a nice crust, was decent, not remarkable, not served warm. The butter was soft and spreadable, which is always what I want, but how could that warrant my dining companion's reaction? The consistency wasn’t the notable part. It wasn’t just butter, it was garlic butter. The garlic flavor was incredibly intense. We all loved it, and wished we had something else to spread it on. At one point, we even talked about spreading it on our upcoming fish appetizers. White Wine from Daily Menu. Most of us ordered seafood, so we decided to get the white wine that was included with our daily menu (choice was red or white, no real details given). 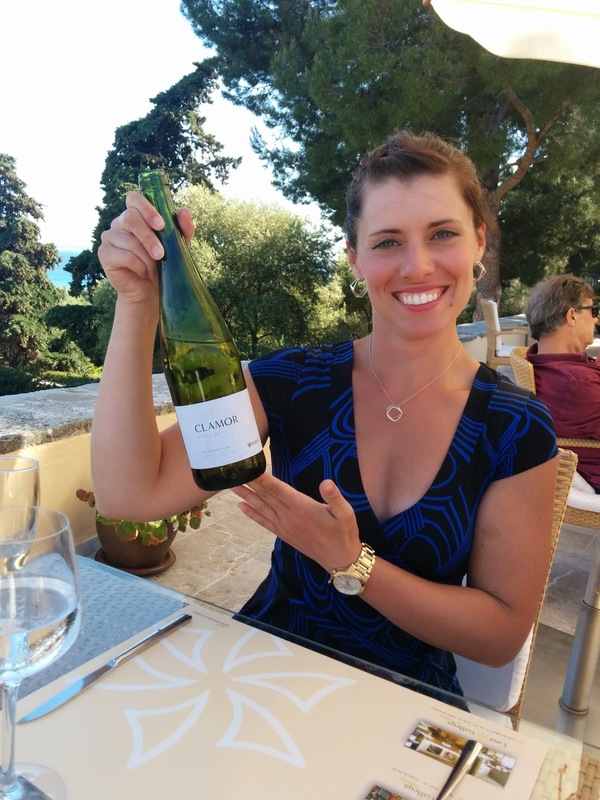 The white turned out to be Raimat Clamor White, a mix of Chardonnay, Sauvignon Blanc and Xarel.lo. It was a bit sweet, a bit buttery, and refreshing on the hot sunny day. We settled in even more, getting more and more relaxed and continuing to take in the scenery. I was impressed that the wine included in the daily menu came by the bottle, rather than just a house wine in a carafe. They also weren't skimpy; another bottle was brought out as soon as the first was poured, along with another bottle of sparkling water, and they were left an ice bucket at our table. I appreciated that they kept the drinks cold, but left us to ourselves to serve them, not requiring intervention on their part, but also not allowing the drinks to get warm. Daily Menu Starter: tartare of salmon with crème fraîche and mango gelatine. I started with the salmon tartare. It arrived shockingly fast after we ordered. Since we’d had such a trek, it was really nice to have bread served so fast, and then our starters so soon too. The tartare was served on top of a bed of mixed micro greens, topped with crème fraîche and mango gelatine, a few sprouts, and was flanked by a pair of tomato halves. I didn’t quite remember the menu details, so when it first arrived, I thought it was a tartare with an egg on top, as that is a fairly common preparation (at least with beef tartare). But as I took a closer look, I realized it wasn’t an egg, and I consulted the menu to see that it was supposed to come with crème fraîche and mango gelatine. Aha! The substance I thought was egg white was actually crème fraîche, and the “yolk” was the mango. Very interesting, a cute play. The rest of the plating was equally nice looking, with several sauces drizzled on the plate. I eagerly dug in, starting with the drizzles. On the rim was a balsamic reduction, which, while tasty, really didn’t seem to go with salmon. A few dots of an herb oil drizzle were in the inner ring. None of us were quite sure what the herb was, but we guessed parsley. It also didn’t really go with the salmon, but was nice to use as a dressing with the greens and tomatoes. The micro greens were fine, not remarkable, and I liked the crunch from the sprouts on top, but the tomatoes were underripe. The tartare itself was just ok. The quality of the salmon was mid-range, not that flavorful, but not a strange consistency or anything bad. Although there were no capers in it, which I always love, there were little chunks of crispy pickle, which I quite enjoyed for the flavor and the texture. The crème fraîche was a welcome creamy component, but I struggled a bit with the combination of the mango and the crème fraîche. One of my favorite sushi restaurants has a roll I enjoy with salmon and mango, so it wasn’t that the salmon and mango combination was strange, but somehow the sweet fruit and the rich crème fraîche and the salmon all at once didn’t work for me. I really wanted the crème fraîche though, and it was hard to separate it from the mango, due to the unique plating. Overall, this was fine, not remarkable, but even the salmon I had on my flight from San Francisco was better. 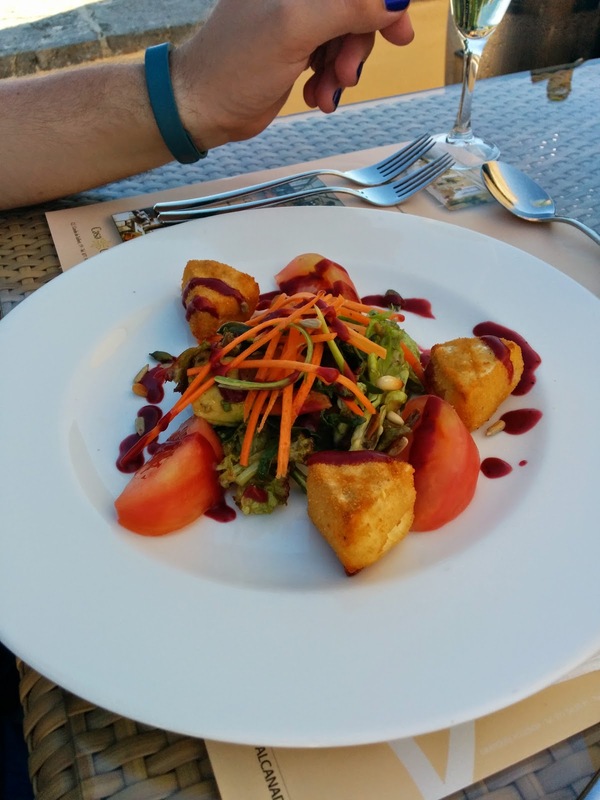 Daily Menu Starter: Salad with fried cammembert and red fruit vinaigrette. The rest of my group all also picked the salmon tartare, save one person who ordered the salad. I didn’t try a bite, but he seemed to genuinely enjoy his cubes of fried camembert. Which, makes sense, because, fried cheese is delicious, and camembert in particular is delicious, so, this sounds like a winner! 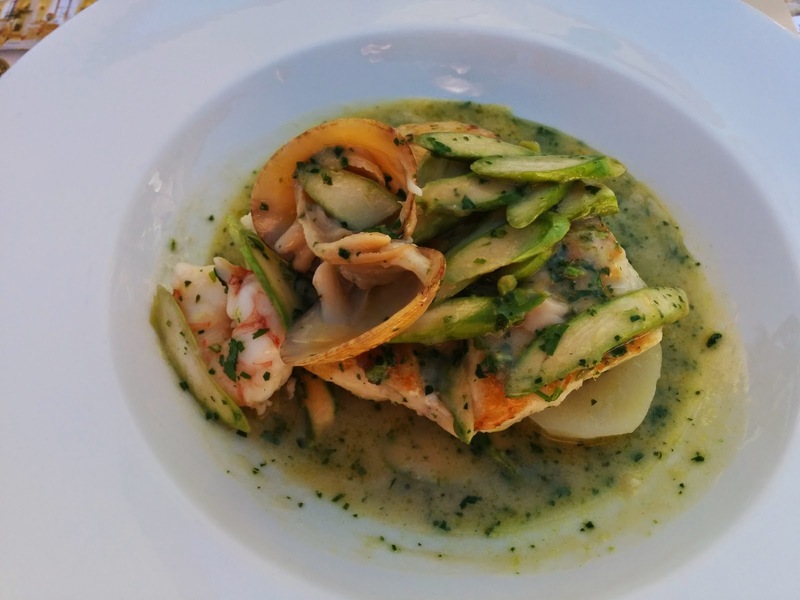 Daily Menu Main Dish: Grilled hake in green sauce. There were two seafood entrees that we could select from, and, not being able to make up my mind, I was happy when Emil suggested splitting them both. 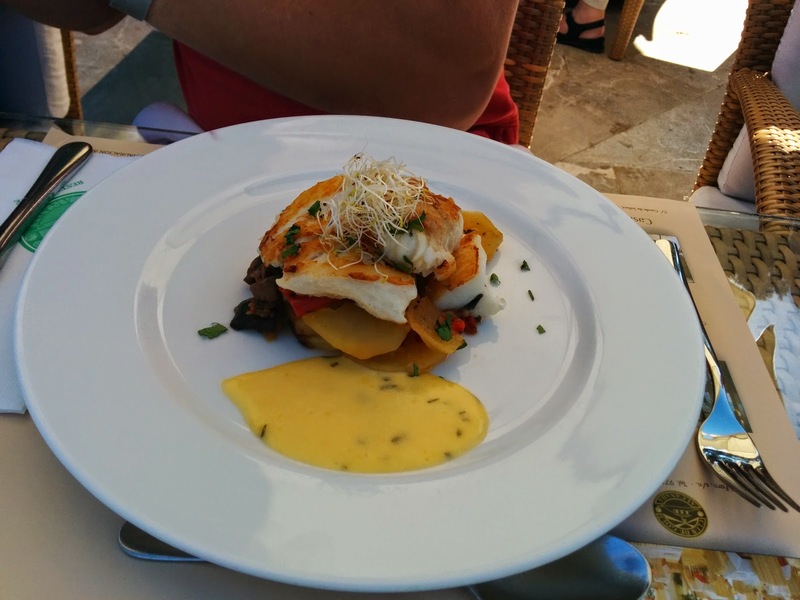 Two other members of my group also selected this entree, "grilled hake in green sauce”. I’m sure I’ve had hake before, but I don’t particularly remember it, and just had a vague memory that it was a mild white fish. We had no idea what “green sauce” was going to be. Was it Italian, like a pesto? Thai, like a green curry? Mexican, like a tomatillo sauce? Who knew. The answer turned out to be an herb butter sauce. It was a thin sauce, almost a broth, that looked a bit watery, but turned out to be loaded with flavor. Herby, slightly garlicky, and buttery, but not in a way that was too rich. It was absolutely delicious, and the second best thing I ate all night. Even though I don’t like bread, I ended up eating two more pieces, just to soak up as much of the sauce as possible. The rest of the dish was less successful. Along with the hake was a single mussel and a prawn. The others who ordered the dish all said the prawn was horrible, very chewy. I let Emil have it. I don’t like mussels, so I also skipped that. I’m not sure if anyone else had theirs. The hake was just ok. A mild white fish, as I remembered, and just as unremarkable as the salmon. It wasn’t bad exactly, but it was just there. The menu said grilled, but it seemed pan seared. It was served on top of huge slabs of sliced potatoes. They were … just potatoes. Again, not remarkable, meh. If I didn’t have the bread, I may have used them to soak up the sauce, but, as it was, I had no real desire to eat them. The final component was shaved asparagus. 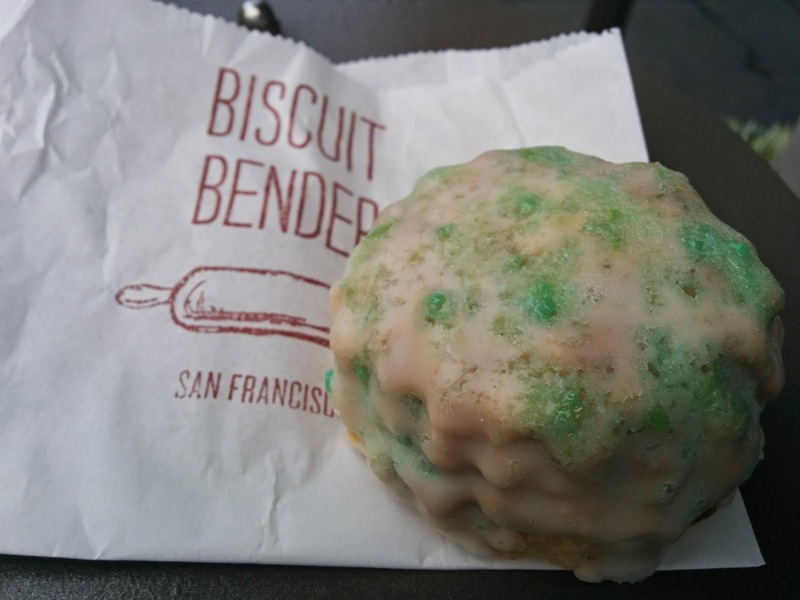 It was crisp, well cooked, but not particularly flavorful. Of course, doused in the sauce that didn’t matter much. Overall, the dish just failed to deliver. Mediocre quality and execution all around, but, the sauce/broth really was quite delicious. I wouldn’t get this again. Daily Menu Main Dish: Assorted Fish. I moved on to the second entree that Emil and I picked to split, described as “assorted fish variety with Boulanger potatoes, vegetables, and Bearnesa sauce”. Another one we weren’t really quite sure what to expect from. What kind of fish? What kind of preparation? Grilled? Pan fried? Raw? What kind of vegetables? Is bearnesa sauce the same as bearnaise? The plate was delivered, with no description given. Emil stopped the waiter to at least ask what the types of fish were. He was told that there was turbot, John Dory, and angelfish. Like the tartare, this dish also came topped with crispy sprouts. And like the hake, it came served over potatoes, although this time they were thinner slices, and seemed almost fried or something. Very oily, and off-putting. On top of the potato layer was the “vegetables”, a mix of peppers, zucchini, and eggplant, a bit like ratatouille, although I don’t recall any tomato. The vegetables were all extremely overcooked and mushy. The combination of the potatoes and other vegetables somehow felt heavy, and not like a fresh vegetable side you’d like with fish. The Bearnesa sauce was pooled along one side of the plate, and was unremarkable. It seemed like it had been prepared long in advance. So finally, the assorted fish. There were 4 pieces, all seemed to be pan seared. We weren’t entirely sure which was which, but took some educated guesses. One, that we think was the angelfish, had a really strange texture. When you cut it, it seemed like lobster, kinda stringy. But it didn’t have the same chew to it that lobster would. I had a few bites only because I wanted to keep trying to figure it out, not because I liked it. Definitely my least favorite, and I think Emil agreed. Next was a fish served with the skin on, which we think was the turbot. It was also just ok, and I took a few bites of it, but didn’t really want more. It seemed similar to the hake in that it wasn’t offensive, but there was really no reason to want it. And finally, the John Dory. This one was by far the best. The fish was flaky and a bit buttery. We think this was the one that there were two small chunks of, and both Emil and I agreed it was the best, and each finished a full piece. Overall, another dish that just wasn’t great. I would have liked the John Dory with a tartar sauce more than the Bearnesa. I also wouldn’t get this again. I think I liked the hake dish more, but, only for the sauce, as the John Dory was the best of all the seafoods themselves. All the fish seemed to be a bit overcooked. Red Wine. 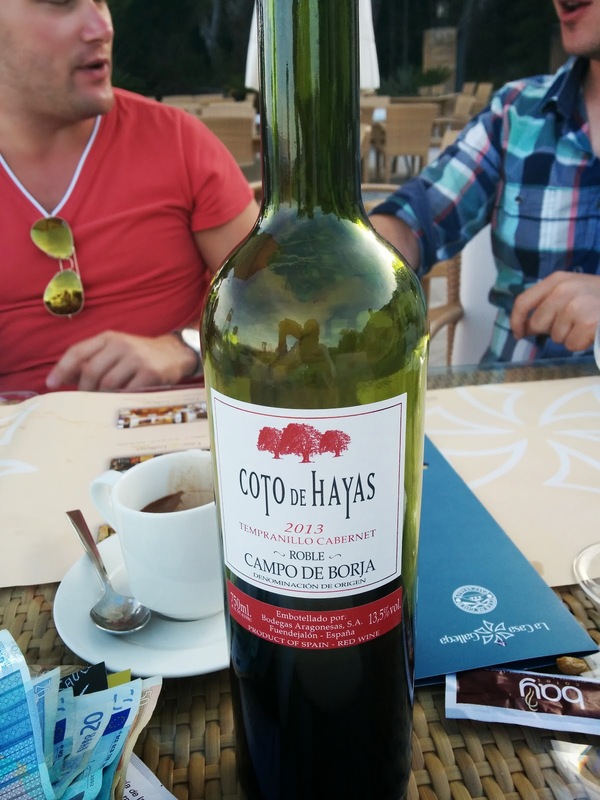 : Coto De Hayas Tempranillo Cabernet Roble 2013. To go with our dessert, we decided to switch to the red wine. We thought that since we had an unlimited amount of wine included with our meals, and since we were given a choice of red or white that it would be ok to switch once we finished a bottle, but we did end up getting charged for each bottle of red. We probably would have picked a different red from the wine list if we knew that, rather than just taking the house red. It was a very classic table wine, quite drinkable, inoffensive. I liked it more than the white, but, the white went better with our seafood dishes. Dessert of the day: tiramisu, sorbet, fruit. Well, you know me and desserts. I love them, and they kinda make or break a meal for me. There was no choice of desserts for the Menu of the Day, so we had no idea what was coming. Actually, the strange pairing was the drizzle on the plate. I thought it was chocolate sauce, as this was a dessert, but instead it was the same balsamic reduction we had with the salmon tartare. While I thought it didn’t go great with the tartare, it really didn’t go with tiramisu. 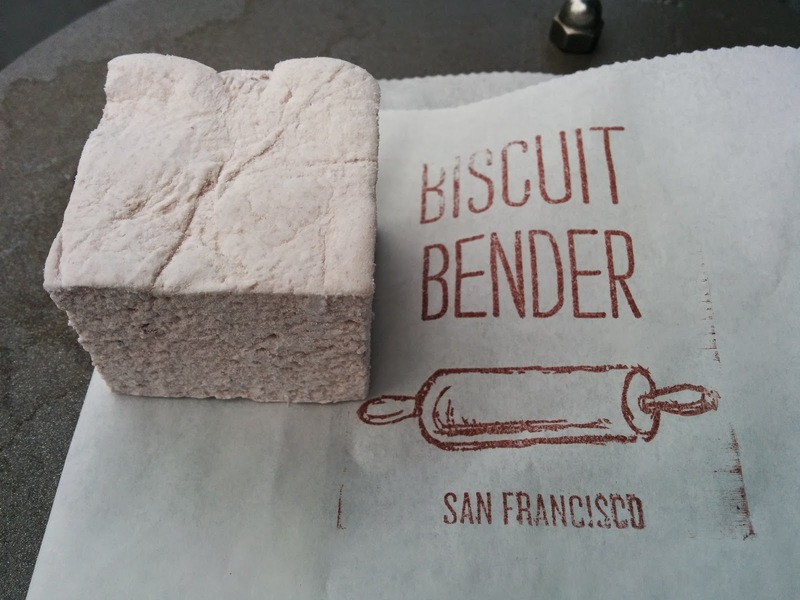 It looked pretty, but … what? I started with the tiramisu. It looked like a pretty classic version. The cream layer on top was ok. The cocoa powder on top was fine. The ladyfingers on the bottom were really, really soggy. Overall, right in line with the meal. Mediocre. I moved on to the sorbet, orange. It was creamy, orange, and ok, but I never really just want a scoop of sorbet for dessert, and, I gave them the benefit of the doubt and tried to pair it with the tiramisu, but that didn’t really work either. And finally, the fruit. A mix of kiwi, strawberries, mango, melons, and a tomatillo. Since I”m allergic to melons, I skipped that. The kiwi, mango, and tomatillo were all just ok. The strawberry was the best part. Seriously, the strawberries on this island were so good. Even the strawberries used for garnish on drinks at the beach bar were better than most I have in the US. I was able to create an enjoyable bite by mixing the cream from the tiramisu with a strawberry, but honestly, this wasn’t a great dessert. Again, nothing was all that wrong with it, but it was mediocre. I wouldn’t get it again, and had no interest in eating Emil’s, which he was totally ignoring, as he doesn’t eat sweets. After a fairly lackluster meal, we still wanted to linger in the space, since it was so beautiful. And since Emil doesn’t eat sweets, he didn’t have any dessert. And since he has fairly high standards, he also had barely touched either of the seafood entrees. So, he decided to take a gamble, and order another dish off the a la carte menu, a fairly risky move at this point since we’d be underwhelmed by everything else. Of course he picked the foie gras, since we can’t order it in California. It turned out to be the best dish of the meal, hands down. Two large slices of foie gras terrine, served with a crazy crispy cracker-like basket filled with a jam, and a salad on the side. The salad made me laugh. It is clear that their kitchen is working with a limited number of ingredients. Same greens we had with the tartare, same underripe tomato halves, same sprouts that several other dishes had. This time, there was also a sprinkle of pine nuts and pumpkin seeds. We think the jam was apricot, and it complimented the foie perfectly. The foie gras terrine was quite excellent. It was very creamy, good foie gras. It didn’t taste livery. We all liked it quite a bit, even those at the table who thought they didn’t really care for foie gras. A bite of creamy rich foie, topped with sweet jam, was quite satisfying. This, I’d actually get again, and I’m really glad that Emil decided to order it, and share it with the rest of us. It made me wonder if we just did the wrong thing by going for the cheap Menu Diario. Yes, the price was excellent. The quantity of food was more than generous. But, the quality wasn’t there. Perhaps if we’d stuck to the a al carte menu, we would have been more successful. We left at dusk. Not exactly the day we had intended, and not the most amazing meal, but an incredible experience.